Welcome to the cyber home for the Minnetonka Saints baseball team. 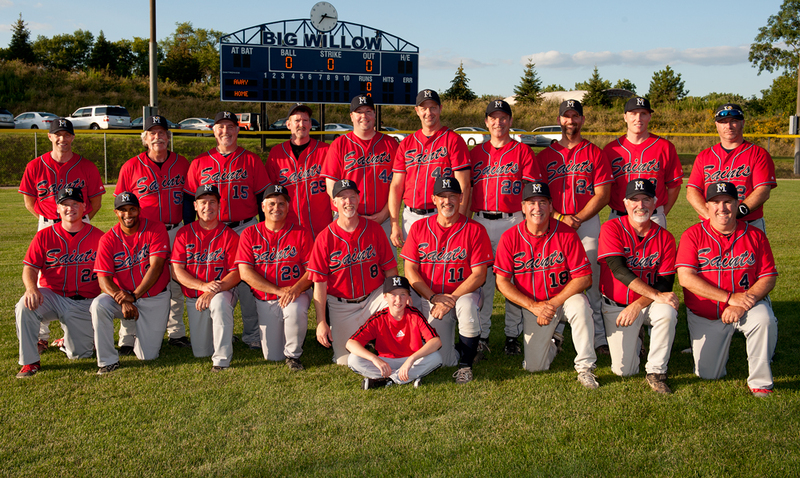 The Saints play in the Federal League which is an over 35 baseball league in the Twin Cities metro area. This is a big change for the Saints in 2015. Many years ago the Saints began life in the Federal League but eventually moved into the Classic League and then the North Star Classic League when those two leagues merged. In a surprise and disastrous move over this past winter, the NSCBL teams panicked after the league president sent word that the MSMABA had altered their 1 ball 1 strike rule and suggested that all of the NSCBL teams join the MSMABA. After a couple of weeks of furious back and forth communication with cooler heads begging the league to stay together and work out some kind of compromise or trial merger with one of the other leagues, one by one teams started breaking the pact and scattered to either the Federal League or the MSMABA. No one expected this to happen and suddenly, what was probably the strongest over 35 league in the state, was no more. The Federal League's rules are much more in sync with the NSCBL and was the best fit for the Saints. Please take a look around the site and enjoy your visit. In particular, you should check out the photo pages and, if you have some time and would like to get a better idea of what this crew is all about, you should read Can O' Corn, The Pipeline and the Noonanator. They're sort of our weekly blogs and show just how demented we really are.